Google’s smart and affordable smartphone, the Moto G, is finally available in Bangladesh. Several importers are already started selling the handset without any warranty. Moto G, which was launched in the last months of 2013 in several markets, is a phone aimed at price-conscious buyers. The device follows up on the philosophy of Google, which acquired Motorola Mobility in 2012. After its acquisition by Google, Motorola is focusing on creating lower-priced handsets. Moto G 8GB version is now priced 19,900 taka ($255) and 16GB version is priced 21,900 taka ($280) in Bangladesh. a dual-SIM version of 16GB Moto G is also available in Bangladesh for 22,900 taka ($295). This is quite a lot regarding Moto G US price but still Moto G is a great performer even in this price range. Moto G is a phone with 4.5-inch screen that has a 720P resolution. It is powered by a middle-of-line quad-core processor running at 1.2GHz. The device comes with 8GB and 16GB storage and has 1GB RAM. The primary camera can shoot images in 5MP while the secondary camera is good for 1.3MP images. The phone is one of the few available Android devices that run KitKat 4.2.2, the latest version of the mobile OS. 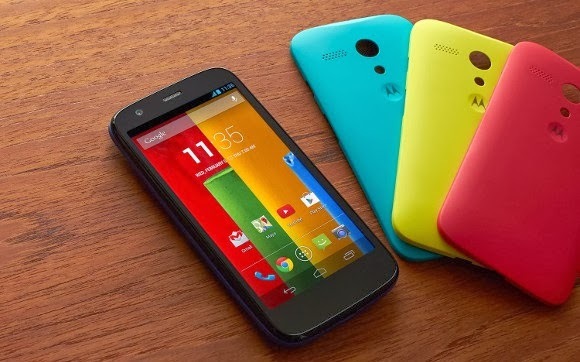 Google has already announced that the Moto G will start selling in India and other markets from January. Google launched the Moto G on the Google Play in the US market on last Wednesday. In the US the phone is officially priced at $179 and $199 for the unlocked versions.